Home » Archive by Category "wordpress plugins"
Are you looking for the ways to add a primary or footer navigation menu in a WordPress site? Follow our step by step guide to adding a navigation menu in your WP based site and showcase the basic structure of it to your web visitors and viewers. Basically, the navigation menu is one of the essential components of every modern website to be a roadbook for your website guests and visitors. As for the primary menu, it’s the basic menu of your Menu Editor, the part which you use to create your navigation menus. The path to this Editor goes through WP Dashboard, Appearance, Menus, Menu Editor. Basically, you, as a WordPress user, are authorized to tweak to your menu items and edit them so that it will appear the way you want. If you choose not to edit the menu, it will enlist your site pages as menu items. To add a primary navigation menu in a WordPress website, open up your Menu Editor and click on Create a new menu button. You will be asked to fill in the name of your menu. This name will be seen only by you and not by your audience. Depending on the theme you run on your site, the Menu Settings and relevant locations for menu under Menu Structure will vary. In one way or another, at least primary option will be available for you. Choose Primary to be the location if you want to add a primary navigation menu in your WP website. If you would like to change the location in future, don’t worry. You can come back and change it whenever needed. On the left side of the opened screen, you will see the list of items, like pages, posts, custom links and categories to be added to your menu. Now, choose the pages to be added to the menu. As soon as the needed pages are added to the menu, it’s time to rearrange them. By default, they are located in the order you are adding them. However, it’s pretty easy to relocate them by simply dragging and dropping them in the sequence you prefer. You can repeat the same process for categories and posts as well. Simply choose the ones you want to add and click on Add to Menu. Apart from posts, pages and categories, you would like to add custom links to your primary navigation menu. For this, you need to click on the Custom Links tab to expand it. Here you will find URL and Link Text boxes to be filled. The first one is the destination of the actual URL you want to add. And the Link Text is for the text describing the link. Once you are finished with adding the required details, go on with pressing Add to Menu. As soon as you add a primary navigation menu in your WP website, you will notice that the title of the page or the post added to the menu is used as the link text. At this point, you can change that text and replace it with another one. Simply toggle the menu item (or click the arrow on the right of the item, as the case may be) the navigation label of which you need to change and edit it. Enter the preferred text in navigation and save your changes. Instead of having a primary or header navigation menu (different theme may have different names for it), you can also choose to add footer navigation menu in your WP site, or embed it in sidebar or other widgetized areas you have at your leisure. As for the footer area, in particular, people are used to casting a quick glance at it with the hope to find the useful links and pages instantly. Hence, since footer areas are highly noticeable and frequently used, setting navigation menu in the footer area can be effective for your audience scrolling down the bottom of your site. In this case, you need to look for and find a widget named Custom Menu widget. Go to WP Admin Dashboard, Appearance, Widgets and add Custom Menu Widget to a footer. Additionally, you need to enter the title text and choose the menu to be showcased in the footer area. It can be an existing menu already available on your site, or it may be a completely new one created for that widget. When everything is properly done, click Save. As for the technical part for adding footer navigation menu, we are done. Additionally, you can use different customization and styling options to give your menu a fresh look and feel. Basically, WordPress based themes are using CSS controls to decorate navigation menus. If you are clueless about writing CSS or dealing with codes, you’d better turn to the help of plugins. Max Mega Menu is one of the feature rich WP menu management and customization plugins you can rely on. With this plugin you will be able to take a full control over your navigation menus and style them to match the overall design of your site. This plugin is ready made to replace the default WP menu with a mega menu and will let you use widgets. It also comes with built in CSS3 transitions, multiple menus support, horizontal mega menus opportunity, Font Awesome Icons pack, Custom Item Styling, Genericon and custom Icons and other useful features and options. Another optimal menu management system you can highly benefit from is called Custom Menu Wizard Widget. This plugin is also ready to tailor to the specific needs of its users in relation to the overall structure and styling of the site menus. The next reliable source of Navigation menu widget is the plugin launched as Advanced Menu Widget. It is easy to follow in usage and management and suggests practical tools to make your menus more flexible and accurate. This entry was posted in wordpress plugins on April 18, 2019 by SKT Posts Themes. Almost all websites nowadays need contact form so that people can contact them online without the hassle of copying email address and emailing them separately or contacting them via phone call. A contact form definitely has its own advantages. Hence it is necessary we choose the right contact form plugin for our WordPress website. Contact Form 7 is one of the most downloaded and popular plugins available in WordPress repository. Contact Form 7 is very easy to use. However its simplicity has had people using it more and more. Plus it is the most oldest of contact form plugins and hence has a lot work done already by many developers. We use contact form 7 on our website and as you can see we have customized it a lot. For customization however you have to write css within your theme style.css and it isn’t very easy to use for non-coders/non-developers. So won’t recommend it for non tech people. But nevertheless it does the job. It also gets integrated with really simple captcha and google recaptcha. Ninja Forms are a very simple drag and drop interface contact form very similar to that of Gravity Forms. And the best part is it is FREE. PayPal Express checkout and other add ons are paid but that one doesn’t require in order to have a contact form for their site. Ninja Forms is comparatively quite newer as compared to other forms which have been there for quite a while. We would recommend this plugin for non techy as well as developers because it uses advantage of both. For non tech people it is easy to use and for developers they can define custom class and make any sort of contact form they like. Easy Contact Forms is another drag and drop interface contact form builder and is easy to use. It has online video tutorials available on how to customize any contact form using Easy Contact Forms. Style settings and other custom css can also be included in order to manage Easy contact forms. This one is also recommended for non tech as well as developers both. The only problem with this plugin however is that none of the support forum problems/questions in WordPress repository has been answered. Hence if this plugin works for you, do use it. But if it isn’t working for you then don’t expect great support unless you can figure things out yourself. Fast Secure Contact Form (earlier SI Contact Form) is also one of the most downloaded contact forms in WordPress repository. The default form looks very bad but one may modify the css to make it look good. Similarly the captcha also looks too bad and one needs to either use different captcha or modify the same. In terms of working Fast Secure Contact Form works similar to Contact Form 7. It is simple, and does the job. However for customizations you need to be good in html/css or else for non tech people won’t recommend this sort of contact form plugin. Visual Form builder is another drag and drop interface WordPress contact form which is easy to use for non tech as well as developers. However it’s not completely free. Yes it does the job in case you want a basic WordPress contact form. For custom form designs you need to pay in case you are a developer then only you can customize visual form builder. Gravity Forms is a Paid plugin and has been in industry for quite long. It has its fair share of developers who like the plugin so much that they continue to use it. Gravity Forms has 1.8 as the latest stable version and it is the first drag and drop interface easy to use contact form which was developed. Sure it has got other features as well like multi part form, limiting entries to the form, scheduling the form, polls etc. So cost wise it seems expensive but the value it gives with $199 is for you to weigh against the pricing structure. vCita is a well known name for online scheduling. They also have a well maintained contact form. This contact form is all good and can be used readily. The only problem with this form is that it does require someone to log into or register in vCita and then customize the form there. Another problem is that it provides an iFrame just like Facebook. So it is additional load time of vCita server which might slow down your website. It does have some fancy stuff which look good and if your site is small or you need online scheduler or want to build a complex form without prior coding knowledge this form will come handy. However if you have a large site and bother about site speeds etc then this isn’t the right plugin for you. Contact Form Clean and Simple uses Twitter Bootstrap and Google Recaptcha. It is worth trying this form as your contact form if you are looking to make your forms responsive. Again similar to contact form 7 and others it requires coding knowledge whereby you can customize the form using theme’s style.css. We are in no way affiliate to any of the above contact form plugin developers and as WordPress theme designers and developers we have reviewed and used these plugins and told you our unbiased review/comments. This entry was posted in wordpress plugins and tagged wordpress contact form plugin, wordpress form builder, wordpress responsive contact form on April 18, 2019 by SKT Themes. Management of WordPress taxonomies and their uses have been discussed here. WordPress offers a wonderful platform with amazing custom services. This most popular CMS is used by the majority of users. For the folks who are interested in creating custom posts, with this article you will be able to understand and deploy custom archive taxonomies. Whether you want to create a custom taxonomy or you want to customize an existing one, here you will surely get an effective solution. The taxonomy refers to a content type in WordPress that is ideal for organizing the content, which possesses some other content type. The most common taxonomies that most of you probably would be familiar with are Categories and Tags. It is assumed that you are aware of both categories and tags in WordPress, these two integral taxonomies with hierarchical and non-hierarchical orientation respectively. Hierarchical Taxonomy means that it possesses a hierarchical structure with parent-child relationships and Non-hierarchical Taxonomy doesn’t exhibit any such relationship. What WordPress does is, it creates an automated archive for each tag, category and custom taxonomy that follows a reverse chronological order and generates a list of associated posts. The site that features posts that are kept well organized with proper tags and categories are comparatively easier to maintain than it is to with custom posts and custom taxonomies. In WP, the display for each archive is defined in template files, thus while moving towards customization, the very first step is to determine which template file is associated with your target. How To Create Custom Taxonomies? There are several ways of creating custom taxonomies, however, the most preferred one is by deploying a suitable plugin. There is no dearth of WP plugins, you can conveniently find an efficient plugin to accomplish the job with a greater proficiency. However, while implementing any other method, it is recommended to create a new plugin for the cause instead of inserting the appropriate chunk of code to the functions.php file. Because, it will make the method less complex and will offer the added advantage in the future by making the created custom taxonomy easily available. For creating a plugin, simply add the below mentioned line of code at the top of the text file boasting appropriate code. Here is the code snippet for a plugin that has been created to support custom taxonomy, which is named as “fruits”. How To Customize Taxonomy Archives? For those who are interested in using WP as a CMS and not just as a blogging tool, they often need to customize the built-in functions of WP, which is easily feasible with custom taxonomies. By default, the WordPress implements the WP_Query class to automatically fetch the posts for the viewers while considering the page on which they are. However, this query can be tweaked for adding custom post types to tag or category archives, for this what you can do is, integrate the pre_get_posts filter. Now, let’s see how it works. The filter helps tweak the query when it is called before any post has been fetched by the WP. You can create arguments (“post” as a regular post and “latest” as a custom post type) to be passed in the WP_Query. By following the below mentioned code. Here, for passing the changed post_type arguments we will need to implement the class method set(). As this method enables one to alter the arguments while the class has been already created. By following the aforementioned guide thoroughly, you will be able to efficiently customize desired taxonomies archives in WordPress. Sophia Phillips has been working as a professional in WordPress web development company and loves sharing information about leveraging multiple benefits of WordPress in the best possible manner. Currently, she has an impressive count of WordPress -related articles under her name. This entry was posted in wordpress, wordpress plugins on April 18, 2019 by SKT Themes. In this article we have successfully sorted out some of the most usable wiki knowledge base WordPress plugins for any kind of WordPress – based websites for having a knowledge base area, FAQ (frequently asked questions) or wiki in order to provide the target groups of audience a thorough information about this or that company or organization, its visions and objectives, the relevant services and products and much more. Review the below – inserted knowledge – base flavors that share a competent tone, look and feel and consider them for acquiring and activating for your online profile. Customer support and knowledge – base system of any website should be considered separately and assured to function impeccably. This is a complex strategy with relevant procedures to undertake and let your customers and clients be sure, that they can greatly benefit from their interactions with your dedicated staff and specialists. Generally speaking, knowledge – base area of your web presence is considered to be your central repository directly from which the dissemination of your premium – quality and customer – driven information takes place. The first wiki knowledge base WordPress plugin in our list is the simplest and the most practical wiki solution is called Very Simple Knowledge Base for to furnish with a centralized place for storing and publishing data for the website visitors to get quick access and find the sufficient answers to their questions. Based on totally responsive design shades to guarantee perfect adjustment when running on the mobiles and tablets, this plugin will let you easily manipulate your categories and posts with 3 or 4 column dispositions. In case of mobile access the columns will appear to be 2. Next is DW Knowledge Base WordPress plugin that is available in the marketplace entirely for free. This useful and dynamic plugin comes with inherently easy to follow installation process and setup, generates amazingly flexible and responsive layout whenever any mobile, tablet or other portable device is called into action, seamlessly integrates with any kind of WordPress – based website and allows anyone to create and manage his website knowledge database with the minimum efforts imaginable. The plugin is also widget – friendly, including tags, categories, popular articles, ordinary or the freshest articles. Customization options are also at your fingertips to turn on or off search form, comments or breadcrumbs. There is also a wide range of modern and highly applicable plugins that are profoundly supported by DW Knowledge Base. With the simplified step by step installation process that will suit its power and usability to the word is WP Knowledge Base. This user and customer – optimized, functionally advanced and smoothly performing wiki knowledge base WordPress plugin come bundled with all the essential features you will need to run an influential and supportive knowledge base web presence with the easiest content management system. Precisely arranged interface of WordPress will help you intuitively create your knowledge base articles, manuals, diverse tips of usages, instructions, recipes , etc. The enumerated features refer to the free version of the plugin. However, you can upgrade to its Pro version for more controls, such as the availability of resizing images, uploading and storing them, adding meta to the body area, etc. KnB Lite is knowledge base and FAQ plugin for adding interactive features to your website such as knowledge database or the section of frequently asked questions for giving all the important interpretations and answers to the most problematic issues. It is the free version of the plugin with shortcode creation and with the potential of using the theme shortcode generator easily. With this plugin support you can showcase up to 4 columns, customize the overall appearance and choose from the available color wheel to go hand in hand with your website of WordPress production. This wiki knowledge base WordPress plugin is also responsive and cross – browser compliant, so that the technical errors and visual distortions are reduced to minimum in all the possible cases. Another convenient way of integrating FAQ functionality into your web pages is generated in the form of The Spider FAQ plugin, checked and updated to be totally simple and lightweight in usage and management, so that you can be sure to enhance your website informativity and save your precious time answering the same questions over and over by guiding all your customers and website readers to your instant information repository as a well – organized FAQ section. With this precise and resilient product the entire content of FAQ will not appear as a mess and can be neatly arranged into categories for the easier search and usage. Standard category inclusion within the section can also be implemented. One more optimal and user – friendly wiki knowledge base WordPress plugin for adding compact and very useful FAQ publication into your website is the Ultimate FAQ plugin. This entirely customizable and easy to control tool will let you use question and answer format for all your website visitors to orientate in a matter of seconds and find all the answers they are interested in. Since the key to a great FAQ section is its practical functionality and presentable design, this stunning plugin is subject to quick customization and management for exceptional look and operation. Thus it will be possible to choose your FAQ style and layout, create categories, share your FAQs in social media platforms, as well as to exercise all its features, review statistics and yet much more to come with the premium version of this plugin. HTML 5 Responsive FAQ is also deservedly included in our collection to add your frequently asked questions and publicize them in your WordPress – authored website in the easiest fashion. Provide your website with the most comprehensive way of satisfying all your customer inquiries without feeling overwhelmed. This is one of the best and the most responsive FAQ practices that will work unimprovably with any type of WordPress website, add diverse categories, change the visualization of the section to consummately correspond to your theme styling and graphical solutions. At times, hiring personnel to handle customer queries can be time consuming and an expensive affair. Getting the same support questions from customers over and over again can be infuriating too. But, with a Wiki Knowledge Base WordPress plugin, you can avoid such situations and save your precious time by guiding all your customers and website readers to your instant information repository section. All you will have to do is create a centralized, detailed and informative site for storing and publishing data for the website visitors to get quick access and find sufficient answers to their questions regarding the company’s products and services. A knowledge-based area of your website is your central repository section where customers go to for more information about your products and services. Therefore, if you are looking to add a support section to your site, then you have come to the right place. With this WordPress plugin, you can create a support site where users can go to, to stay updated about your business, products, and services. In most cases, you will find customers making several enquiries through other channels about your products and services and at the same time, feeling frustrated when their questions are not answered in a timely manner. If you are in the profit-making business, this is something that you would want to avoid as it can cost you lots of potential clients and of course, a drop in sales or profits. With a Wiki Knowledge Base WordPress Plugin, companies can ensure that commonly asked questions and answers are made accessible to clients in minutes. It is actually easier to just add this plugin to your existing WordPress site than you think. On the other hand, it is essential to know that customer support and knowledge base systems of any website are completely different and should be considered separately. Customers and clients should be made to understand that they should engage your dedicated staff and specialists at times, as they can greatly benefit from these interactions. With Wiki Knowledge Base WordPress plugins, you can easily convert your WordPress site into a wiki-style informative site. We have successfully sorted out some of the best and most usable knowledge base WordPress plugins for any kind of WordPress-based website for having a knowledge base area, FAQ (Frequently Asked Questions) or wiki, in order to provide the target groups of audience thorough information about your company and its products or services. These plugins have an easy to follow and simplified installation process and set up and can run on mobile phones and tablets. Just like the knowledge base, the FAQ plugins discussed here are easy to control, customizable and for some, they let you use question and answer format for all your website visitors in a bid to orientate and find the answers they are interested in. Review the below–inserted knowledge –base flavors that share a competent tone, look and feel and consider them for acquiring and activating your online profile. How to Guide For Using Google Fonts With Google And Plugins! If you are a designer, you are more likely to consider typography as the foundation of any website design. Not only selecting the fonts but also providing an edge to the readability of web pages. Typography is all about selecting line length, point size, line spacing, typefaces and adjusting the spaces between the groups of letters. Why is Google Fonts a clear choice? There were times when the internet had standard fonts that would bore anyone looking at them, but as time paced, the web designers and developers were forced to limit their live text font choices and design the fonts that are compatible with the greatest number of users over the Internet. They came up with CSS3. Typekit initiated it. Typekit developed some of the enticing fonts that helped designers selecting appealing and user-friendly fonts for their web pages, but the only issue in using Typekit was the cost they charge to their users. The price was $49 and in case a designer would want to develop two sites, he had to pay $99 just for using fonts on the web page. Thanks to Google who came along with its brilliant font designs and offered it for free. It’s quite obvious that you don’t get free what you can get with money but believe it, the Google Web Fonts were nonetheless than the one offered by Typekit. Of course, Google Web fonts are best when you don’t like spending too much on fonts as you know building entire website costs too much. As of today, there are over 647 fonts separate font families in the Google library. When you’re selecting a font for your website’s content, it’s imperative to view it in a similar fashion to how you’re going to implement that font. Some fonts look perfect for body content but dreadful as a heading. Luckily, Google Web Fonts allows you to customize your preview to match your use case. You can enter custom preview text, and change your preview size as preferred. It is important to preview any header or body copy you are going to use in paragraph view and if, you have a lot of body copy, don’t use too much custom fonts. Funnelling Down The Right Font! Take a quick look at the fonts that are recently updated by Google. The chances are you’ll get the trending and bug-free font without having to look rest of the fonts. Also, see the fonts used by most of the designers and developers. Doing this will allow you to know of versatile fonts that you can use in multiple styles and widths. If you know the typeface for your website, characteristics and style of fonts can improve your results like if you want a handwritten font, disable all other types of results. Google allows you to refine your font search further by adding thickness, slant and width of the character as filtering options. Isn’t it cool feature to get the best font for your website? Quick Use: To quickly take a look at the font you like. Pop out: To know more about the font that you like i.e its functionality and uses. Collection: If you want to use more than two fonts, Collection is the button you need to click on. It’ll add all the fonts that you like on a single page. How To Use The Google Fonts? Google and Typekit, both developed this code in here as a part of WebFont loader to give the users more control over font loading. With The Help of Plugins! There are some plugins available that offer seamless Google Font integration. Using Plugins has its limitations like a plugin won’t know to look for particular text without customizing further with the help of HTML or CSS. But still, here are few plugins to include Google fonts to your website. It is an easy and effective way to inlay Google fonts to your website with only a few clicks. You can either use your stylesheet or use CSS style; both will work to adapt them to your theme. You can do it from admin area or your website’s stylesheet. WP Google fonts is all you require for your website, quickly and efficiently. With Easy Google Fonts plugin, you don’t need to touch any coding to get the fonts on your website. From choosing to optimizing and giving unique colors to live to preview, everything with fonts can be done using Easy Google Fonts. Supreme Google Webfonts will add all 291 Google Web fonts into your visual editor panel when you are developing pages or posts. Just install it and start using it. Click on “Appearance” and then click on “Customize”. We hope, reading the article was a learning lesson to use, and now, it’s time to use this knowledge on your website. Browse through various fonts, plugins to improve the typography in your websites. Keep in mind that if you are customizing a font, it’ll be more beneficial than just copy pasting a font. Let us know the fonts and methods you use to add typography to allure your audience in your projects. Fonts enhance the aesthetic form of a website and are the foundation of any website design. Fonts or typography is all about selecting line length, point size, line spacing, typefaces and adjusting the spaces between the group letters. As a designer, it is always good to refine your font search further by adding thickness, slant and width of the character as filtering options. Not all fonts look good in the body and/or heading content. Some fonts do not look good as a heading and others cannot be read easily on the body content. Therefore, it is advisable to view you selected font in a similar fashion to how you are going to implement it so that you can test its readability. Gone are the days when the internet used to have the same old boring standard fonts. Technology advanced and web designers and developers were forced to design fonts that are compatible with the greatest number of users over the internet. They came up with CSS3. Typekit initiated it and developed some of the enticing and appealing fonts for web designers to use. But, they were too costly. Thankfully, Google came to the rescue and offered brilliant, user-friendly font designs for free. Funneling Down the Right Font! Take a look at the recently updated fonts on google and get a trending and bug-free font. Also, look up fonts used by majority of designers to allow you to know about the versatility of fonts that you can use in multiple styles and widths. Know the typeface for your website, characteristics and style of fonts to improve your results. Refine your font search by adding thickness, slant and width of the character as filtering option. Collection-If you want to use more than two fonts, click on this button. It will add all the fonts you like on a single page. Standard-This is a standard stylesheet link. Place it in the head part of your HTML file. It will save you the step of adding the @import rule as you are significantly adding in a stylesheet that already has it. Catherrine Garcia is an experienced Web Developer at Hosting Facts and a passionate blogger. She loves to share her knowledge through her articles on web development and WordPress. This entry was posted in wordpress plugins and tagged Google font plugins on April 18, 2019 by SKT Posts Themes. How to add fancy content by using shortcodes plugin in WordPress? Shortcodes in WordPress are specific bits of codes enabling you to perform different things while saving your time and efforts. Basically, they are used for adding fancy content and files, as well as creating objects without having to do with complicated coding. These custom elements or macros are essential parts of any WordPress template and are used to make any website presentable without any programming skills. Whether you want to add a beautiful slider on the top of your homepage, embed video and audio files, list posts of the relevant category and author, etc, shortcodes are what you will ever need. WordPress is unspeakably rich with different shortcodes plugins which come with great shortcodes and thus make your digital life a lot simpler. Against this background, in this article we are going to shed light on the best WordPress Shortcodes plugin and understand how they can contribute to your digital presence. Shortcodes Ultimate is a top class WordPress shortcodes plugin available in the WordPress marketplace. It comes bundled with a bulk of easy to use tools and controls to get maximum profit from your WordPress website. So far it has been one of the most trusted and popular solutions to add fancy content to posts and pages. Shortcodes Ultimate is highly optimized for all those users who are not comfortable with coding and need a simpler platform to work with. For the sake of the user convenience, the free version of Shortcodes Ultimate plugin offers you around 50 shortcodes and has a shortcode categorization by type, like content, media, library, data, box and more. You can add a video, table, display images and boxes, highlight text, add a quote, Google map and more in the easiest manner. Additionally, with this plugin you are also provided with default styling options, as well as with option to define your own style. It’s a handy tool to exercise in order keep your website’s overall design and its content in visual harmony. All you need to do is to make use of Shortcode Creator, which is among premium add ons of this plugin. Other add ons available are Extra Shortcodes to give you 15 additional shortcodes, Additional Skins with 60 additional skins, as well as all in one Add ons Bundle. The next attractive touch of this plugin is that in most cases you can have preview of your work before it will be added to your site. Preview the initial results and change them accordingly. Another reliable way to supercharge your website with much needed plugins is via WordPress Shortcodes. Create and add your content easily and quickly with this WordPress shortcodes plugin and dress up your WP powered website the way you prefer. Highlight whatever is important for your website and present not to be missed parts in a fancy way by the application of WordPress Shortcodes. Add the needed tabs, sections, layouts and other parts to your site and easily make use of the shortcode editor with preview option. All in all, there are more than 26 elements and shortcodes integrated into this popular plugin. Additionally, WordPress Shortcodes is perfectly suited to work with any WordPress theme and template, since it complies with all the modern standards of WordPress community. Custom Content Shortcodes unites simplicity with powerful performance when it comes to equipping you with the required capacities. This WordPress shortcodes plugin is user and developer friendly, well thought out and adapted to any kind of usage with WP themes. Create your custom content and insert it in any part of your site. As for the [content] shortcode available with this plugin, it can display posts, pages, custom post types, images, menus, fields or widget areas. As for the [loop] shortcode, it makes query loops and can display products in a category, excerpts from recent posts, etc. On the whole, Custom Content Shortcode encompasses a wide variety of query parameters to organize the display of your site content, relevant URLs for images and links, as well as optional controls like Gallery Field, Mobile Detect and more. If you want to get access to a big family of shortcodes, look no further than Fruitful Shortcodes. This highly effective and smart WordPress shortcodes plugin will provide you with a list of shortcodes once you have installed the plugin. All you need to do at this point is to select the ones you need. They are automatically added to the post as soon as you click on them. Although you will not find too much customization and styling options in this plugin, the default design and look of the available shortcodes are more than accurate to complement your website’s appearance. As for the list of available shortcodes, it includes horizontal and vertical tabs, accordion, columns 1/2, 1/3, 1/4, 2/3, etc, separator, promo text, button, alert, etc. WP Shortcode by MyThemeShop is another valuable destination of shortcodes. It’s a premium class plugin and is intended for the general use. It means that a WordPress user who is clueless about coding and development will be capable of adding fancy content, buttons, tabs, pricing tables and more to his WordPress site with simple clicks. It includes 24 shortcodes and makes it super easy to insert them into a post or page. Just go to the post or page you want to add a specific shortcode and click on the green plus icon in the toolbar. A comprehensive list of available options will appear. This entry was posted in wordpress plugins on April 17, 2019 by SKT Themes. Are you looking for one of the best ecommerce plugins to build the online version of your brick and mortar store, create product catalogs and listings, display products wherever needed on your website and generally create an excellent shopping experience for your customers? Today we are going to compare 5 best WordPress ecommerce plugins so that it will be easier for you to understand which one suits your needs and objectives better. Since the advent of the global networking system, ecommerce activities have become something valuable in terms of smashing all kinds of international and geographical barriers and bringing the commercial world closer together. And whether you are a startup businessman trying to find more clients for your local store, or have planned to go transborder to take advantage of the current e commerce based market at a lower cost, your entrance to the web based reality is highly appreciated. Although WordPress themes are developed with e commerce and WooCommerce in the developer’s mind, there is always a chance to strengthen the functionality of your WP based website or blog with better commercial touches and capacities. Below you will find the comparison of 4 best WordPress ecommerce plugins so that you can make a right decision when it comes to acquiring the needed ecommerce tool for your website. However, with any of them you can quickly pair with your website and do your shopping business across the continents without much of a hassle. Naturally, our list of the best WordPress ecommerce plugins opens WooCommerce, just because it is the most downloaded and much trusted commercial platforms by WordPress users. While the current status of this plugin has passed the exam of time and thousands of users, we are going to share both advantages and disadvantages of it leaving the final vote to you. It is well developed and well supported. WooCommerce is authored by Automattic and has a user friendly and experienced community standing behind it. It means that any WooCommerce user will be well supported by the responsive developers of this product. Many add ons and themes. WooCommerce suggests an avalanche of extensions and themes with dozens of options and controls so that you can result in the best look and feel of your e commerce website you have always wanted to have. It is well documented. Along with a five star technical support, WooCommerce comes with complete documentation as well. Abundance of options. There are too many options and features WooCommerce users are going to find when working with this platform. Particularly, for the novices, it is going to be time consuming and bewildering to make heads or tails of WooCommerce options. The next highly valuable shopping and e commerce solution among the best WordPress ecommerce plugins we are going to explore is Shopify. Let’s see the pluses and minuses of it. It’s cost effective and affordable at least at the beginning. All in all, it’s the best open source commercial platform for different businesses coming as a mixture of quality and pocket friendly pricing, technical support and unlimited products possible at one place, but only if you are a beginner and don’t need to have much at your disposal. You can have access to the basic features of Shopify with $29 (monthly price). It supports both physical and digital products. It means you are free to open up a store for any kind of goods and merchandise, from clothing and bags, construction materials to ebooks and music, videos and courses, web elements and more. Payment and shipping options, as well as social media integration are also among the advantages of Shopify. Fewer content management options. Well, Shopify is product management system and not content. But whenever you want to add some extra content to your products for a more descriptive view or showcase videos or carousels, Shopify is not the best option in this case. Easy Digital Downloads is one of the best recommendations for all those businesses who are selling digital products. Simple to start with, easy to use, multilingual ready, payment systems supportive… The advantages of this plugin are many. It makes selling digital goods effortlessly easy. From software and programs to ebooks and tutorials, training materials and courses, graphic designs and photography, professional services, translation, consultation, tickets, articles and more, absolutely any kind of digital product can be easily sold with this plugin. Payment gateways integration by default and with add ons. Offering payment methods and gateways to your consumers is of great importance in terms of their convenience when it comes to buying and paying online. Easy Digital Downloads supports PayPal Standard and Amazon Payments, but you can use extensions to integrate even more options. It does not support non digital and external goods. Having this plugin for selling non digital goods is never a good idea. Add ons needed for selling external products. Whenever you want to add external or affiliate product, you will be required to turn to a third party add on. Another platform incorporating the qualities of the best WordPress ecommerce plugins comes as Shopp. It’s a reasonable solution both for startups and professional developers with an easy to control features for storefront management for the first group of the users, and more flexibility for the second one. This plugin is well coded and secure. With Shopp you don’t need to worry about the security of your online shop or store at all, since the authors of this plugin have kept their focus on the important aspect of security and protection. Different product types support. Add and sell any type of product you produce, make, own or somehow dispose of, whether, physical, digital or virtual. Limited free support. If you feel you need any help to make the most of this plugin, you need to pay for it. Few WordPress themes. Although Shopp functions well with all kinds of WP themes, there are not many options which have been developed specifically for Shopp integration. This entry was posted in wordpress plugins on April 17, 2019 by SKT Posts Themes. Are you a seasoned photographer or freelancer and want to prevent image theft in your WordPress website or blog? Here we are with some of the practical ways to prevent stealing of your site’s images and photos. Image theft is one of the popular problems many WordPress users are faced with. For as long as the digital world of photography arrived and has been in existence, so has been the possibility to steal images and photos. Hence, protecting your own images showcased on a website or a blog becomes one of the headaches for many WordPress users. However, you are not powerless when it comes to preventing image theft in your WordPress website or blog. We have taken the trouble of looking for the best ways to protect your site’s images from being downloaded or stolen or any other unauthorised use. You can use any of them and make the theft of WP images really hard, if not impossible. Since images are vulnerable and unprotected elements displayed on your site, taking care of their security and copyright issues is of primary importance. Let’s see what you can do to prevent image theft in your WP website or blog through copying and downloading, right clicking or another way. 1. Copyright notice added to your images. Fortunately, fighting against illegal usage of your WP images is quite simple. All you need to do is to arm yourself with certain tools, elements, plugins and watermarks to protect your valuable visual content. One of the simple ways you can exercise is to a add copyright notice to your site’s images and photos. Once you have created or shot an image and uploaded it to the site, you are the only owner and distributor of it. Hence, adding also a copyright notice is a practical way to prevent plagiarism of your images. If you want to have copyright protected images, Footer Putter plugin can be your assistant. It will enable you to add notice on the footer area of your site so that it will be visible on every single page. It’s a feature rich plugin offering you to create two widgets: a Footer Copyright Widget and a Trademark Widget. You can also include a copyright statement that is changed automatically as the year changes so that you will never have old dated copyright. All in all, this plugin takes care to showcase the credibility and real nature of your business or personality and lets you demonstrate your ownership over your website content, including also images. Another useful method to prevent image theft in your WP website is to disable right click functionality. If you run an image centric website and virtually demonstrate your portfolio and photoshoots, disabling right clicking on your website really makes sense to protect your material. WP Content Copy Protection and No Right Click knows the way to protect both you site textual and image content. IT disables the text select and right click functionalities, so that no one will be able to copy your texts and images without your permission. This easy to install and configure plugin is available in both free and premium versions. The premium one comes with more controls like watermarking your images, usage of htaccess rules and more. Alternatively, you can choose this plugin if you want to disable only right click actions catering to images and have other right click actions working normally on your website. Upload this plugin from the WP library for free and enjoy its features to prevent image theft in your WP website through disabling right click. Basically, a watermark is a transparent or less visible text, image or logo placed over images and photos to identify the creator or the owner of it. It easily protects any visual content and makes it almost impossible to copy and use it without any traces of its origin. Hence, if you want to “sign” your photos and images to prove your legibility, here are some of the useful tools at your disposal. automatically add a watermark to any image you upload to your site. You can also choose to watermark your images manually. 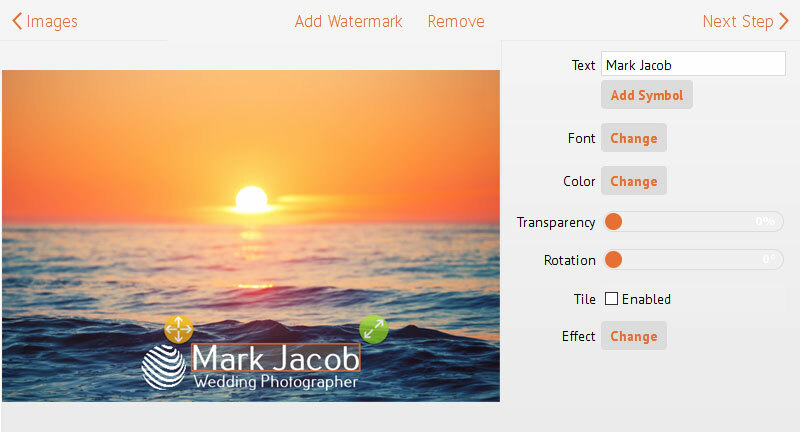 Additionally, Easy Watermark comes bundled with management options to set text, color, rotation and size of the watermark to be added, its format to be jpg, png or gif and much more. Image Watermark is another highly effective choice when it comes to automatically watermarking your site’s images. You can enable the watermarking of all the images being uploaded to your site or choose the post types for the watermark to be applied. Apart from plugins, there are also free online services offering the same watermarking functionality for WP users. Visual Watermark is an online service making the process of watermarking your images pretty easy. If you try to use any design software or program like Photoshop to watermark all your images one after another, you will probably need hours. The advantage of this service is that it is ready to watermark a bulk number of images all at once so that you can save tons of time. Moreover, Visual Watermark offers its custom templates if you have not created any yet. Add your text, image, logo or whatever you want on your image as a watermark and work both offline and online. Water Marquee is another free online platform to watermark your images before uploading them to your WP site. It does not require installing any application or software on you mobile or PC to start watermarking your images. This entry was posted in wordpress plugins on April 16, 2019 by SKT Themes. A splendid assemblage of the best and frequently installed WordPress podcasting plugins to enjoy incredibly practical and user – friendly podcasting solution with boundless capacities. Modern podcasting system, having its roots in far back 2000s through diverse platforms, is one of the handy tools at present both for individual and corporate digital usage. Whether your website is entertainment or multimedia – based, businesslike with video and audio files required to be shared with your audience, podcasting integrated into your website can be the best strategy you cannot live without for a wide array of reasons. If you ever wondered how to integrate a handy and credible, flexible and energetic podcasting plugin into your WordPress – based website with pretty little hassle and endeavor, the answer is right here. We offer you to delve in the below – mentioned list of WordPress podcasting plugins for every techy or non – techy WordPress user to manipulate with them effortlessly and result in a dynamic and attention – grabbing, interactive and multimedia – based website to allure and satisfy all your website visitors. Moreover, all of them are repeatedly checked and updated to escape all the errors and drawbacks. And what is more enjoyable at this point is that each of them is in full compliance with WordPress CMS system and its products. Energized and integrative, fully user and develop – optimized, powerful while totally lightweight, Libsyn Podcast is among the most dependable podcasting tools one can ever have as a helping hand. From simplicity in usage to intuitive performance, everything is minutely taken care of in this plugin. As a solid ground for your further actions, Libsyn Podcaset is ready to provide you with a basis on which you can add and practice any podcasting activity web profile or blog without facing any lack of control and surveillance. However, this plugin is still in beta version needing additional updates and interventions for the final outstanding product and a true contendor of WordPress podcasting plugins category. Armed with more than 40 templates to make selection from, fully customizable and user – friendly to be exercised without any coding knowledge at all, Cincopa is also among the best WordPress podcasting plugins to easily add videos, photo galleries and albums, slideshows, music and playlists and showcase them in a nicely – formatted fashion. Hence this podcasting system can be ideal for tons of websites with certain working direction, ranging from personal and hobby, music and portfolio, fashion and design to business and corporate, video and audio blog, developing and digital production and other relevant WordPress – powered web presences. This HTML 5 – based plugin also celebrates total responsiveness and thus is ready to respond to any suggested mobile or device screen size and requirements. Podcast Player is another simple, yet handy tool in our roundup for a website admin of any background and coding preparedness to host a podcast through his WordPress – authored website. Even if you are not expert in podcasting – related career, be sure that with Podcast Player plugin you will be guaranteed against any kind of major challenges hampering your website ordinary functionality. Hassle and error – free, well – managed and launched, this is a plugin worth total attention and consideration for your website of any kind. If you ever feel overwhelmed with the necessity of adding podcast plugin to your existing or future website and feel bewildered with the offered choices, there you are with your competence to consider Podlove plugin here it is as one of the time and security – checked WordPress podcasting plugins ready to serve all your relevant needs. It comes as a whole podcasting integration and management system with its multi – dimensional and multi – format publishing opportunities, zealous and resilient templates, chapter information publishing opportunity and even optimized web player inclusion for your convenience to deal with audio and video files. Podtrac plugin feels fantastic when it comes to supporting and securing Seriously Simple Podcasting plugin added to your website. Those two are custom – built to generate strikingly useful tandem to convert all your podcasting – related efforts into something worth higher applause. Hence establishing your online podcasting – based identity or community, look no further than Podtrac to make the whole process of podcasting integration into your web system as painless as it is possible. With this tool you can also be granted with episode redirect, feed redirect and other options to be controlled effectively. One more homogenous unity of form and function, simplicity and precision in usage comes launched as BuzzSprout Podcast as one of the most active installed WordPress podcasting plugins. Custom built to support you any relevant undertaking, this plugin requires the existence of your Buzzsprout accounts, and WordPress account to provide you with accurate and precise audio players, iTunes, Stitcher and yet much more to be available with this plugin. You will be capable of migrating from your old podcasting system into this one without any difficulty. With simple, yet valuable and highly useful tips and tricks, PowerPress podcast can boast with its 50,000+ active installs and client loyalty. Totally iTune compliant and equipped with advanced migration tools, this plugin will never leave you in the middle of the road. Even if you are a novice in the field, no worries about creating and serving fully customized and responsive podcast feeds to your target audience for subscription. The plugin is also accented with SEO aspects for better ranking results. As one of the simplest podcasting solution for any WordPress – based website and its user, Seriously Simple Podcast will certainly show a helping hand to anyone when it comes to using the given framework to make it podcast – friendly. Get all the suggested podcasting tools and options valid for you in the most affordable fashion and broadly make use of them. Armed with complete user documentation, it comes with optimal shortcodes and widgets for episode lists, single episodes, podcast playlists the way you want. Podcasts have become so popular lately. The number of shows on the podcast has also gone up and if you are thinking of starting one for yourself or your company, then you have come to the right place. We have put together a collection of WordPress Podcast Plugins for you to choose from. People turn to the podcast when they need or are interested in specific content. Unlike in TV and Radio, podcasts’ audience is narrow as only those interested in a particular topic, sign up or subscribe. It is one of the handy tools at present for both individual and corporate digital usage. Radio and TV stations normally operate on set programming hours and if you miss it, well, oh unto you. For Tv, some broadcasting houses may upload YouTube videos on their channel but in some cases, it is never a guarantee. But, with the podcast, there is no particular schedule or programming. You can access your subscriptions anytime and the viewpoints allowed are more. While not anyone can be a radio or Tv host, anyone can be a podcaster. All you will need is proper equipment, a strong Wi-Fi connection, editing software, good content and of course, a website. A podcast can be created from anywhere. You do not have to travel or leave the comfort of your home or office to connect with your audience. It is very convenient. Also, podcasts help build relationships and trust with the listeners. One of the reasons why your audience is hooked to your podcasts is that they share the same opinion as you. If you have a website of whatever kind with videos and audio files to be shared with your audience, then having a WordPress Podcast Plugin integrated into your website is the best strategy. The importance of a podcast is that it allows you to build your online community as well as get feedback on your program (s). It is common knowledge that good news travels fast but guess what, a good podcast spreads even faster. Therefore, to ensure you retain your audience, you need to make sure that your audio series are continuous. Podcasts have been reported to create awareness and gain new audiences for businesses that have incorporated them into their marketing strategy. Also, the number of businesses using podcasts has increased tremendously. So, do not be left out. With our splendid assemblage of the best and frequently installed WordPress Podcast Plugins, you will be able to launch a podcast right on your website and enjoy incredibly practical and user-friendly podcasting solution with boundless capacities. The list of plugins discussed below is for every techy or non-techy WordPress user to manipulate in a bid to achieve a dynamic and attention-grabbing, interactive and multimedia-based website that is sure to satisfy all your website visitors. The advantage of having any of these WordPress Podcast Plugins is that they are repeatedly checked and updated to escape all the errors and drawback that might arise. And what is more enjoyable at this point is that each of them is in full compliance with WordPress CMS system and its products. This entry was posted in wordpress plugins on April 15, 2019 by SKT Posts Themes. In this article a rundown of the most popular WordPress audio music player plugins are discussed. These WordPress audio music player plugins are suitable for all musicians and musical bands who want to extend the borders of their fan – zone, as well as podcasters and entertainment website owners who want to engage their audience with multimedia files. WordPress content creation and management system is continually susceptible and responsive to the digital spectrum and technology – based world which are developing at a rate hard to keep with. Hence we are lucky enough to consider WordPress templates custom – built to move our personal or business initiatives from old – dated or traditional paths into new and more aggressive ones. With the same working principle and from the same reliable viewpoint, WordPress products do offer a default support of audio files to be used in diverse formats. However, if you are a musician or a member of musical band, author or producer, composer or portfolio owner and need broader extensions and functional capacity for your audio files, WordPress audio music plugins will inevitably act in your favor. All in all, whatever your relationship or status with audio files, our list will definitely help you in your decision – making process of what is the most relevant for your specific website. From private storytellers and e-book authors to independent composers and other talented individuals can feel the necessity of embedding audio files in their profiles and share them with tons of website visitors. Naturally, not all of them will have deep developing coding to puzzle out of complex coding and other procedures. Audio album is developed and coded specifically for those technically “sluggish and cumbersome” people to make the most of their WordPress – based environment when supported by this plugin. Another plus of this plugin together with simplicity in usage is the capability of adding as many audio albums as you may wish to have for your digital profile. The functionality of Audio Album revolves around two simple shortcodes: [audioalbum] and [audiotrack] for adding title, details, date, height, width and much more. Another compact audio solution in our range of WordPress audio music plugins comes launched as Compact WP Audio Player. While supporting .mp3 and .ogg file formats, this plugin has been checked for its consistent cooperation with a wide array of modern and highly applicable browsers and devices, including Andriod, iPhone, iPad, IE7, IE8m Safari, Firefox, Chrome and more. Hence Compact WP Audio Player celebrates total responsiveness across all the major responsive devices and lets all your mobile and device users enjoy your audio files while on the move. With this plugin you can easily embed your audio files into posts and pages without facing any major scrape. Even the autoplay option comes loaded with this plugin so that you can enable this function whenever the page loads. Fully adaptive and customization – optimized, user and developer – centric, competent and challenging, HTML5 jQuery Audio Player is a comprehensive and nicely – arranged tool at your leisure to solve all issues catering to audio files inclusion into your web presence in a simple, yet effectual fashion. It is a product that will be stunningly supported by all modern browsers, among them iPhone and iPad. Some of the essential controls of the plugin include mp3 and ogg file formats usage, attention – grabbing and beautiful design, browser and device compatibility, as well as the possibility of enabling or disabling the autoplay. It can be a highly impressive award specifically for those who want to sell their music right from their online profiles. This can be easily organized via HTML5 jQuery Audio Player when united with Easy Digital Downloads. Please, meet CP Media Player that is scrupulously projected and launched, well – managed and well – laid out to comply with your WordPress – powered website effortlessly. This plugin is also well – trained to go hand in hand with any suggested major browser, such as IE9, Chrome, Firefox and Opera. It means that your website visitor is free to choose his or her favorite browser to scan your content and deal with your audio and video files in particular. The same rule applies when trying to access those files via this or that low – powered device. The result is the same – fantastic functionality and precision across all the devices and mobiles. As one of the world – class WordPress audio music plugins, this product will let you publish your audio or video player anywhere you find expedient. The next plugin worth you review and consideration is called Simple Audio Player with readily customizable and easy to exercise nature. With more than 7000 active installation and subsequently thousands of satisfied clients, this plugin comes bundled with all standard audio player features, customization – ready flesh media player and player color and size changing options. Another noteworthy and time – checked, fully manageable and user – optimized audio integration control included in our list of WordPress audio music plugins is called HTML5 MP3 Player with Playlist Free. It enables its users to utilize HTML 5 to activate audio playback in the browser. Compatible with all the major browsers, this plugin is armed with Playlist, Repeat, Stream Seek, Volume Control, Timer, Play and Pause and many other options as well. And last, but not least, here is Gallery Gmedia as a complex multimedia solution for all those website owners who are seeking for all in one yet affordable plugin to better their web results with interactive content. With this plugin you can instantly add files, create slideshows, insert audio and video files, etc. The number of photo and audio files available to be loaded is not restricted, meaning that you can add as many as you wish and group them in separate galleries and audio playlists. This plugin is also inherently responsive and cross – browser compliant. We all love some good music regardless of the genre. Whenever we want to listen to music, we either do it from tuning into our favorite radio or Tv station, Youtube, SoundCloud or our favorite playlist on our iPods. Digitization of music has made it very easy to find any audio or video music file on any music platforms online. Musicians at times struggle with selling their music to fans, and getting airplay on Radio and Tv stations. Convincing DJs to play their music, be it in clubs, gigs or parties is also another hurdle. From private storytellers and e-book authors to independent composers and other talented individuals, the necessity of embedding audio files in their profiles and sharing them with tons of website visitors can never be underestimated. However, with the variety of WordPress Audio Music Player Plugins discussed here, musicians, musical bands, composers, and producers can now market their own music and engage their fans with multimedia files, while extending their fan base. With a website, you will not only have all your music files in one place for easier access by your fans, you will also be able to receive immediate feedback from them. Whatever your relationship or status with audio files is, our list will definitely help you make a wise decision of what is the most relevant for your specific website and needs. WordPress is the best method of displaying your music online. It offers a default support of audio files to be used in diverse formats. It allows you to play any audio music or video files. WordPress content creation and management systems are continually susceptible and responsive to the digital spectrum and technology-based world which are developing at a rate hard to keep up with. Hence, we are lucky enough to consider WordPress templates custom-built to move your personal or business initiative from traditional ways of selling your music into a new and more aggressive one. Depending on the WordPress theme you choose, these WordPress Audio Music Player Plugins support .mp3 and .ogg file formats, are beautifully designed, customizable and compatible with an array of modern and highly applicable browsers and devices including Android, iPhone, iPad, IE7, IE8m Safari, Firefox, Chrome, Opera and many more to allow your website visitors choose their preferred browser. In addition, the plugins, are very easy to use and in some, you can add as many audio albums as you wish. But, if you want to have the power to enable or disable auto play, sell your music right from your online profile, then the HTML5 jQuery Audio Player would be the perfect fit. These WordPress Audio Music Player plugins will definitely make visitors visit your site often and stay hooked to it. And, if you have the Gallery Gmedia plugin, you will not be restricted to the number of photo and audio files to upload. You will be able to create slideshows and add video files. It is a one in all yet affordable plugin that is going to guarantee you web results with interactive content. The global networking system with its advanced functionality together with WordPress content management system with its user and customer nature offers every single individual or business representation a wealth of opportunities to exercise all their e-business and e-commerce activities and give their online commercial business a go. It’s an obvious truth, that the commercial – ready potential is limitless in the digital environment when your website is provided with out-of-the-box e-commerce basis, being well –optimized for the flawless cooperation with a number of popular WooCommerce -powered plugins for increasing your online shopping functionality. In this article we believe in offering you the best and the most trusted 12+ WooCommerce based plugins which are truly practical and easy in installation, as well as further customization, aiming at meeting all your commercial and business strategies, plans and contributing to their transformation into reality. Booster for WooCommerce is highly flexible and adaptive, immensely powerful and extendable, smart and intuitive WooCommerce solution for boosting your website commercial potential. This amazingly designed and supported plugin comes loaded with lots of essential features, including bulk price convertor, currencies, currency exchange rates to be automatically updated, possibility to specify different currencies for external products, add multiple currencies and set product prices in them, arrange categories, product listings, etc. The next top –rated and highly versatile WooCommerce plugin compatible with your WordPress – powered online presence is WooCommerce Customizer generating lots of customization and management options, so that your website will look and feel e-commerce ready. By the application of this plugin you will be able to add to Cart button text for all your product types, manage the number of products, which are going to be showcase in every page, customize heading text for the “Product Description” and “Additional Information” tabs and undertake other customization processes. WooCommerce Sequential Order Numbers is another WooCommerce – based plugin ready to go hand in hand with the E-Commerce – supported nature of your web pages. The advantage of this plugin is the way it sets sequential order number for new orders in an automatic mode, thus making the whole process more comprehensive and precise. No coding knowledge is necessary for dealing with this simple and smart product. WooCommerce Checkout Field Editor (Manager) Pro plugin will definitely extend your WordPress – authored website WooCommerce and E-commerce possibilities to another level by letting you edit and manage checkout fields on your WooCommerce – based page. Do not worry about how to add or customize custom fields in billing, shipping or other sections, display order details page and Email, remove, disable or enable certain fields, since this plugin will let you do all in the easiest way. WooCommerce Currency Switcher is a compulsory plugin for all those online store owners and private entrepreneurs, who want all the potential at their website disposal to switch product prices on the website on different currency values and realize their conversion. This plugin includes 3 widgets: currencies switcher, currency converter and currencies rates, as well as automatic conversion of currency depending on the visitor’s IP address. WooCommerce Products Filter is a must – have WooCommerce –based plugin to drive your commercial activities to a step forward. With this highly practical and comprehensive plugin you will have lots of options at your disposal to exercise, besides, it will be fairly easy to filter your available products according to product categories, attributes, tags and custom taxonomies. WooCommerce Custom Product Tabs Lite is another plugin to boost your WooCommerce powered and WordPress compatible online store presence and operation. With the great assistance coming with this plugin it will be possible to create a custom product tab with each single content, and that tab may contain text and html, as well as shortcodes. WooCommerce Products Per Page is designed pixel perfectly and ensured by super functionality to be compatible with any WordPress – based modern website catering to commercial businesses. This amazing product is ready to insert “products per page” dropdown on your website and let you customize dropdown position in the page, list of options visible for users, number of available products per page and much more. If you are looking for all – in- one WooCommerce solution option to run on your online profile for better online store functionality, look no further than the plugin called WooCommerce Products Carousel All in One. You may stylize your digital platform with carousel display to showcase newest, featured, bestsellers, on sale and others in the most eye – catching and consumer – driven way. WooCommerce Stock Manager is considered to be another highly – popular and preferred variant for advancing the WooCommerce potential of any website performance. This is a great tool to manage and control your stock for products and their types. It lets you set “Manage stock”, “Stock Status”, “Backorders” and “Stock” for every product and its type available on your market. WooCommerce Stripe Payment Gateway is very suitable and dependable Stripe payment – based plugin to add diverse payment possibilities to your online shop. Use this plugin and establish strong commercial ties with your customers and let them make online payments via Visa, MasterCard, American Express, Discover, JCB, Diners Club and other popular cards for the sake of their convenience and comfort. WooCommerce Multilingual is WooCommerce and WMPL – based e-commerce plugin to support multilingual usage of any website. This plugin includes lots of controls and features to let you translate your WooCommerce products and their types, manage the translation of product categories, tags and custom attributes, sends emails to the users in their preferred language, etc. This entry was posted in wordpress plugins and tagged increase WooCommerce productivity, WooCommerce add ons, WooCommerce efficiency, WooCommerce extensions on April 15, 2019 by SKT Themes. How to add donation buttons and PayPal buttons in a WordPress website? Wondering how to add donation buttons in a WordPress website? This article will accompany you through the steps of adding donation and Paypal buttons to your non profit, NGO, business, school or another website. Donation buttons are convenient donation tools to grow a non profit organization or fundraising. Donating online via PC or portable devices is the easiest way for thousands of people worldwide to contribute to the implementation of this or that charitable program or campaign, donate for some business event, product, plugin, etc. All in all, your efforts to add donation buttons in your website will be profitable both for you and your online audience. Reduce the fundraising costs for your charitable, religious, educational or scientific website. Give your potential contributors, donors and fundraisers an opportunity to act online while on the move, at any time and from the convenience from their homes or bedrooms. Additionally, you will establish a strong communication ties with younger generations you are used to doing everything online. Now, if you are seriously wondering about how to add donation buttons in your WordPress powered website and start accepting donations online, follow our step by step guide for adding donation buttons manually or through relevant plugins. 1. How to add PayPal donation buttons in WordPress manually. First of all, you need to create a PayPal account. If you already have a PayPal account, log in and click on Tools menu item. In the opened page, click on PayPal Buttons. Further, you need to find Related items on the right and use Create new button link. When you create a button, choose Donations under Choose a button type. On this page, you can also find customization tools. Choose to display credit card logos, to use smaller button, language and country for button or to use your own button image. Then, you need to choose currency and contribution amount. You can choose to let your donors enter their own contribution amount. As soon as you are done with this part, click on Create Button. Next, you will be able to see the code which is required to display PayPal donate button. Open the email tab and copy the given link in any text editor. Next step is to go to your WP Admin Dashboard and edit the post or page you want your PayPal donate button appear on. Make sure that you are using text editor mode instead of visual editor. Don’t forget to use the link you have copied in the text editor instead of “Email URL that you got from PayPal”. We are finished. Now you have the required donation button added to your site. If you want to locate it on your sidebar, paste the above mentioned code inside a WP text widget. 2. How to add Paypal donation buttons using a plugin. If you are looking for a simpler way to bring online donation functionality to your WP site, you’d better use this method. You can find lots of free donation plugins in WordPress repository of plugins. However, navigating your way through the avalanche of such plugins can be irritating. Therefore, we have chosen one of the best PayPal donate plugins to do a top class job for your site. Start with uploading ‘paypal-donations’ folder to the ‘wp-content/plugins/ directory and activate it through WP Plugins menu. Now, you need to visit Settings, PayPal donations page for further customization. In General tab, you need to add your PayPal email, as well as choose the currency for the donations. Additionally, you can find optional settings, like Page Style and Return Page. As for the Page Style, you can add a custom payment page URL that exists in your PayPal account profile. As for the Return Page, you can provide a URL which the donators will come to once they are done with their donations. It can be a Thank you page or the like. Now, let’s pass to the optional settings. You can set the default amount to be received as a donation, state the purpose of donation and reference for the donation. Finally, you are offered to select a button style. An alternative way to add Paypal Donations button to your WP site’s sidebar is to go to Appearance, Widgets, add title, text, purpose and reference. Once you are done with filling the fields, don’t forget to Save. Anyway, PayPal Donations is not the only plugin that can be a wise contribution to your website, especially, if you want to add more than donation buttons. This plugin is custom built to grant you with a reliable donation framework so that you can accept online donations easily. With Give you can have totally manageable donation forms, review and monitor donation statistics, as well as use other payment gateways and tools. You don’t need to pay a single penny to acquire this plugin. It is available for free and as such is suitable for non profit and tax free organizations and companies, as well as for those working on a tight budget. This plugin is a good alternative to PayPal Donations, since this one also offers paypal buttons integration into your site. It offers you 9 standard Paypal donation plugins. You are also authorized to use your own custom button. Moreover, by the application of PayPal Donation Buttons, you can display Donation Goal and Donation List history on your page, post or widget. This entry was posted in wordpress plugins on April 12, 2019 by SKT Themes. Customer reviews and testimonials are one of the practical ways of measuring your quality services that is directly proportional to your client satisfaction. Otherwise stated, client evidence is one of the major factors of influence as today millions of people are inclined to perceive it as a guiding principle for their decision – making whether to trust the website they are browsing or not. Hence, ensuring a perfectly designed and flexible reviews and testimonials management system into your web presence will form an integral part of your future success with a clear cut thought for your future clients that your existing customers are seamlessly over the moon with your services or products. The easiest way to embedding reviews and testimonials area for your customers to showcase their satisfaction or appreciation is finding reviews and testimonials WordPress plugin for your WordPress – based product and run it in the simplest fashion. Exactly for this purpose, we have sort out the best samples of such plugins to add reviews and testimonials as a trustworthy and convincing factors of your credibility. Enable your client reviews with those plugins and enjoy all the on-site ranking benefits coming along. Strong and full – featured while totally lightweight and fast – performing, Testimonial Free is one of the most convenient and affordable reviews and testimonials WordPress plugins that will provide you with out – of – the – box performance. And while advantages of this product are endless even with its free version, some of the basic functions include readily responsive and cross mobile and browser compliant web design, precise and nice looking appearance, intuitive installation and configuration processes that will not take long, and finally, impeccable cooperation with each and every WordPress – based website of any size or description. In case it doesn’t seem to be enough, you are enabled to upgrade to its premium version. By showcasing the great client feedbacks on your website you predefine your first – time website visitor’s perception of your business to the great extent. Under this necessity, Testimonial Rotator proves to be an ideal version for adding testimonials to the relevant WordPress – powered website or blog easily and effectively. This plugin with thoroughly thought – out structure and schematic markup is totally free of charge and comes integrated with powerful features, including the possibility of changing rotator settings, add testimonials to diverse rotators, enable star ratings, custom templates availability, etc. The next stable and resistant, time – proof and error – free reviews and testimonials WordPress plugin for an average WordPress user without any basic programming knowledge is Strong Testimonials with its lite and pro versions. This testimonial system will let your categorize your testimonials for the avoidance of inordinate look and showcase them in multiple ways as the admin may think expedient. Lite version also offers star ratings, manual and automatic excerpts, thumbnails inclusion, preloaded templates with diverse layouts, simple pagination system, and much more. You can also choose to display your testimonials with a help of beautiful slideshows moving around your content, so that your website viewers will instantly catch them. Easy Testimonials is another top – class and checked testimonial solution for your digital product. It’s a user – driven and easy to follow plugin, which is packed with premium quality features. By the application of this amazing plugin one is capable of adding testimonials as a customized widget or embedding them to posts and pages with a shortcode insertion in a matter of seconds. With Easy Testimonials it is also up to you to decide how your testimonials are going to be displayed, whether or not with image, rating or with Schema.org compatible markup. Handsome Testimonials has been coded and launched to provide us with another credible phenomenon in the format of reviews and testimonials WordPress plugin. Statistics show that it is another preferable way of arming your site with the nicely – fashioned and truly practical testimonial and review system and enjoying all its upsides in favor of your personal or corporate business online. Based on the user and admin – driven and simplified installation and configuration processes, Handsome Testimonials is available in free and premium variants for the beginners and for pro users accordingly. The plugin is also highly customizable so that you can edit it to match your website overall style and operational directions. Making a stunning and nicely – formatted testimonial availability for any WordPress product has never been so easy and entertaining as it is with totally responsive and customization – ready plugin called just Testimonial. Integrating social proof and positive client feedback to your web presence will be a joy with this system without any complex procedures and irritating configuration controls. Add and showcase your slider – based best testimonials in a creative and original way, use awe – inspiring testimonial carousel, customize and change the colors of the slider, publish your testimonials in a categorized manner and be sure they’ll appear in the most responsive fashion. Create your inspiring and beautiful client appreciation system and drag new customers and followers to your business, give you a variety of channels to manage it as per your wishes and objectives with the great assistance of Testimonials. This reviews and testimonials WordPress plugin will enable your existing clients to leave their feedback and persuade the potential ones that your business is worthy of dependence and loyalty. Based on HTML5 design, the plugin is profoundly responsive and adaptable, has listing and slider layouts and an overall shortcode – driven blameless functionality. The same is true about its Pro version, naturally, with extended functional potential. One more highly – rated and originally – worked out testimonial inclusion method available as for present is called IG Testimonials letting you add testimonials to your WordPress – supported website or blog at a glance with a shortcode or widget. This detail – oriented and easy to deal with plugin combines testimonial custom post type and category inclusion, responsiveness catering to testimonial slider and its carousel, carousel setting configuration options, as well as ability to adjust testimonial image sizes, etc. In today’s world, all different business be it local or global across different industries use social media and online website for marketing purposes. Making your presence on social media and online website is one of the cheapest and easiest methods to effectively reach your customers. However, it is easy to assume that when a good amount of traffic is being generated on your website it automatically implies that the customers are happy with your product or business. This is not necessarily true. For a business to grow consistently and to make more effective decisions, it is always important to obtain customer feedback through testimonials or reviews. Many observations and market statistics state that on popular shopping websites, customers do not generally buy products with bad reviews. Obtaining reviews and testimonials from customers is critical to boosting your business’ growth as well as to prove your credibility to the world. They allow you to compel a customer as to why they should buy from you. Hence if you already have a website with a business up and running or planning to build a website to start up a business it is crucial that you add in the option of reviews and testimonials for your customers. With the help of our Reviews and Testimonials WordPress Plugins you can now receive multiple positive and negative reviews that important in making the next big decision for your business. A good word from your customers can really make it or break it for your business. It has the potential to turn your business into gaining amazing profits as reviews and testimonials, in turn, acts as a free marketing tool for your business. There has been a widespread trend for customers to go and read a review before buying any product since many reviews and testimonials regarding products and businesses are easily available on the Internet. If you already have a website up and running for your business and are failing to find improvement in the growth of business then you have your answer here. Our modern and powerfully built plugins are sure to expand your customer base and also help you become a potential brand name in the market. Hence don’t think twice, just choose the plugins you feel that will suit your business the best and order away from our website. This entry was posted in wordpress plugins and tagged client appreciation WordPress plugins, client review WordPress plugins on April 12, 2019 by SKT Posts Themes. To make the web content more zealous and interesting, as well as generate more leads and prospects, irrespective of the nature of their online activities videos are required. Integration of video content into your website is a plus for you for lots of reasons – starting from better visualization to increased SEO results. The reason why embedded video materials can be more informative and interactive is the evidence that tons of people are keen to click to play and watch videos rather than read long write ups and posts or any other static content. As far as search engine optimization of your digital profile is concerned, keeping your website interactive and entertaining will “persuade” your website visitors to stay in your arena longer and come back over and over. In this relation, we at SKT Themes have put some of the video gallery WordPress plugins through the wringer to test them and reveal the best ones. Show instead of telling your story, tell about your company or agency, showcase your songs and albums, highlight whatever is important to your profile and keep it energetic and lively in around the clock with any of the below – discussed plugins. Huge IT Video Gallery is one of the top – rated, safe and secure, widely popular and trusted video gallery WordPress plugins so far with as many as 40.000 active installs and thousands of satisfied users. Well – dressed and full – featured, this wonderful plugin will be an ultimate solution of making videos an integral part of your website and showcasing video links in convenient and practical video galleries. Powered to support Vimeo and YouTube video channels, this plugin celebrates 7 amazing views for you to review and choose whatever suits your website overall style and identity. Use the specific shortcode to add videos on any page or post, write a title, add description and organize everything in the blink of an eye. Create and display your video trainings and tutorials, boost your sales and purchase rates with the help of explanatory videos when supported by Contus Video Gallery. It is an unbeatable product at your leisure to create and showcase beautiful and results – driven videos and keep your web audience informed and entertained. Easy installation and activation of this plugin are waiting along the way and will not take long. The plugin is flexible and affordable enough for an average website admin to exercise the given framework without additional help of developers. It comes armed with a bulk of useful elements and features to keep your video galleries accurate and precise in usage. All in all, you are entitled to add video materials from YouTube, Vimeo, Daily Motion, Viddler, create playlists and subscribe user channel. Ffmpeg support, easy customization options, watch history availability for users, option to pause the videos for storing in history and many other valuable features are also accessible with this plugin. Meet Cool Video Gallery as another creative and well – dressed, admin – optimized and intelligent video gallery WordPress plugins on can have added to his WordPress –based profile and create attention – grabbing video galleries. It comes with possibility to upload videos, add videos from YouTube portal and deploy them in numerous galleries. Highly customizable and integrative, smart and secure, this simple yet effective video gallery building ecosystem feels like fish in water when it comes to uploading or adding videos to boost your website’s engagement and usability. The top formats, including H.264, FLV and MP3, multiple video upload feature, gallery title and description adding options are also suggested by this exceptional plugin. Share option for the videos can be easily enabled or disable via admin – panel as well. YouTube Channel Gallery is also included in our list of video gallery WordPress plugins since this plugin knows the perfect way to connect your web audience with the best videos from YouTube. Find the right spot for video materials and contribute to the visual storytelling of your personal or business profile. Specialized in working with YouTube as one of the largest music destinations for now, YouTube Channel Gallery lets you showcase latest thumbnail videos for YouTube user channel playlist. Click on the thumbnail and the playing of video will follow it. This plugin also takes care of your website mobile users, as it uses YouTube IFrame player IPA to generate HTML5 player. It is also up to use to decide whether you want to use this premium – quality yet simple plugin as a widget or as a shortcode. In case you are looking for a robust and dependable video gallery solution for your WordPress – generated website, look no further than Workbox Video from Vimeo and YouTube. However, this plugin is more convenient for advanced users with some background knowledge about the field. In that case this stable and smart plugin is ready to do all the hard work for you so that nothing catering to this product will make you feel confused. It suggests one of the practical ways to add and manage video pieces on your WordPress – based website or blog. It has been checked for its consistent compatibility with Vimeo, Wistia and YouTube as the main sources of video materials. Download and activate this plugin in a matter of minutes and add videos by merely pasting the URL of the target video. Online is all about creating interesting content that people will have the enthusiasm to go through. Be it creating photo galleries, or video galleries, or something else. The modern world of today loves to watch more content through their eyes than just read a whole bunch of page long articles. That’s why YouTube has become so famous not only for content creation but also for making people take in all that created content. From various DIY (Do It Yourself) on recipes and other important things that we may face in our daily lives. So, in order to make a potential user play and watch your videos, and even come back for more, you need something special. A good website will just not make the cut. You need a great website along with various tweaks in the SEO or Search Engine Optimization results, to get ahead of your competitors. A great website will always make your viewers happy and more interested in what they see. From showcasing your songs, albums or anything, you need a special tool, like Video Gallery WordPress Plugins, and let it do its trick. From plugins that will specifically suit your own website, from just customizing it to your own liking. Can support various video channels like Vimeo or YouTube, etc. and you can even add titles, descriptions, make a post and thereby help the website to organize everything. And if you’re worried about time, then this whole process would be done in just the blink of an eye. From creating various kinds of video training or tutorials, that will help your users, concerned with what type of audience you are targeting. Thus, it will help you boost your current sales and purchase patterns, and thereby bring more profit and returns, to the content you’ve just created. From easy installation and being flexible, plugins will just be installed in the blink of an eye. Not only that, the plugin will also be affordable for the average user so that the overall costs can be kept low as well. There will be easy options for customization for the average users, and these will be rightly available with these WordPress plugins. Goes to show, how much it will boost your own productivity. Not only just being customizable will do the trick. There is also support for various kinds of file systems, like H.264, FLV, MP3, etc. so uploading in any popular format won’t be any such problems. There are also included various kinds f extra features, that will make your video galleries look more beautiful and sophisticated. There are also plugins, that will support HTML5 too if you want. From creating eye-catching thumbnails, and hype-creating tiles, it will all be a child’s play for the normal user. Also, there should be no problems with your mobile users as well. They will also be taken care of, via this Video Gallery WordPress Plugins. There will be no compatibility issues, and every part of your website filled videos will be taken care of. Just exactly how a video related website should be made. This entry was posted in wordpress plugins on April 12, 2019 by SKT Posts Themes. Event Calendar Plugins in WordPress have been discussed and how to set them up. It’s not a surprising fact that thousands of individual and business corporate websites are revolving around WordPress foundation, as the latter provides an excellent environment with all the necessary fundamental functions and elements for any kind of online undertaking to be revealed with its full potential. Apart from that, it comes with super easy self-hosted structure, requiring no coding or programming skills to be exerted. WordPress as a full-featured content management system can be progressed in a range of certain ways in order to function accordingly and suggest all the required functional and configuration options to meet all the qualifications and requirements put against the relevant website. our attention so that you are able to choose any of them and set up events on your website of WordPress. All of the below suggested plugins are worthwhile for dozens of advanced and applicable features to display all the relevant events, manage them, create online booking, ticket sales and other abilities. The Events Calendar is a professionally developed and highly popular event calendar plugin, which provides you with all the potentials to create your upcoming events and occasions in the most beautiful and expressive way. It is also worth noticing, that the whole process will be given to you easily and require as short a time period as possible. Some of the most noteworthy features are fast event creation, calendar month view, day view, event search, Google maps integration, events categories and tags, Ajax based structure and other options. Apart from the standard functionalities, the Pro version of this super versatile plugin comes with alluring design, lots of advanced features, among them recurring events, selling tickets with the most suitable e-commerce solutions, community events, letting the website users add their own events, Facebook events to import the relevant events from Facebook and manage them and much more. CP Multi-view Event Calendar is the next convenient and easy to use calendar, which is available in WordPress.org for free. This smart and handy product is loaded with diverse calendar view options, such as classic month view, multi-month view, day view or week view, diverse visual forms and styles in combination with the selection of your favourite colour, options to configure the start day of the week, to change the appearance of the event calendar, to select the buttons you may wish to be displayed to hidden, to chose the way you want the event calendar information to be accessed, to set up 12 or 24 hours format, to link the events to other pages and to choose your native or favourite language support from the suggested language list. attractive design and structure, recurring events, filterable events, sharing option with popular systems supporting iCalendar, Google maps integration, categorized colour-coded events, day, week, month and agenda views, inbuilt calendar theme editor and SEO-friendly events and is well optimized for multilingual use. Spider Event Calendar is a highly competitive product according to its technical characteristics and feasibility that will keep your website visitors aware of any upcoming events. It will grant you with full control and supervision over the plugin and all its components to make certain modifications and customizations to reach the required output. This dynamic, engaging and user friendly WordPress event calendar is power-packed with lots of event configuration and management features and controls over multiple events at the same time – infinite number of calendars and unlimited event display for each calendar, upcoming events widget inclusion, option to display any month on the calendar, multiple events display on the same date, month, week, day and list views available, category creation with the help of diverse colors, etc. This powerful plugin is also built on the basis of a complete responsive platform to keep its extraordinary look and feel irrespective of the device or mobile, on which the relevant website will be displayed. This plugin will delight you with professional-level performance and quality to publish and manage upcoming events into your website and follow them. Despite the functional saturation and perfect operation of Simple Events Calendar, this plugin is very light and fast functioning. It comes with multiple customizable ways to provide your event-centric websites up to date, by adding events to any post or page with specific shortcode insertion, dates and labels to add special events and undertakings, option to display both expired and forthcoming events in the calendar, as well as to limit the number of events to be displayed, hide Twitter button and not only. This entry was posted in wordpress plugins and tagged event calendar plugins WordPress, events plugin WordPress, WordPress events calendar, WordPress events plugin on April 11, 2019 by SKT Posts Themes. A collection of the most practical and award – winning samples in the repository of the best WordPress donation plugins especially suitable for charity funds, non – governmental and non – profit organizations for motivating people to give a helping hand to those in need and promote their generosity. With ever – lasting importance of charitable, NGO and non – profit websites calling for humanism, philanthropy and generosity for accomplishing diverse universal and niche – specific goals, the organizational part of such online programs and events turns to be an integral part of any website in order to exercise all the possible ways of receiving funds and aids from any contributor, donor or subscriber across the globe. In this relation, WordPress donation plugins are all that any such website will need in order to get a complete look and functionality for any kind of fundraising and donation campaigns. All of them celebrate the most versatile touches and functionally tech – savvy performance together with a handy package of essential plugin features. They are stylized to fit a wide array of relevant charitable and donation projects and reveal the most optimal ways for the website visitors to take part in the ongoing events and send their financial means via the most accessible payment gateways and channels. Smooth and error – free, simple and lightweight, Give is a WordPress donation plugin for easily embedding donation receiving and management system into any kind of WordPress – powered website pertaining to any NGO or non – profit activity. This exceptional plugin is full of truly convenient and dynamic options letting you manipulate your online projects reasonably, avoid additional commission or other charges and take a general control over each and every part of your donation content and data. Give comes with Paypal and other payment systems, tons of customization options to edit and configure whatever is needed, ability to setup custom user roles for effective management of the website, unmistaken donor giving mechanism without any clutter, etc. Charitable is another premium – quality and highly effectual donation and charitable plugin of WordPress compliance that gives a run down on how to professionally take care of the website donation acceptance and management. This ecosystem is too elastic and intuitive towards any usage, meaning that anything can be smartly controlled and operated without any coding hassle for the web admin. With minimum activation and setup time required, Charitable supports Paypal and offline donation ways to exercise with the help of available portal add-ons: Stripe, Authorize.Net, PayUMoney, PayFast. Just like the previous plugin, this one also gets away from any supplementary charges or financial loss on the way. The next WordPress donation plugin tracked down by us for supporting any online charity, fundraising or donation events, projects and campaigns to get their affairs so swimmingly is Seamless Donations. It is one of the most popular and credible templates to extend the functionality of your charitable trust or NGO – type website and streamline the donation processes, so that all the willing candidates will spend less time and efforts to feel the magnitude of their shares. While being affordable entirely for free, this amazing product is totally controllable and trackable, so that all the statistics, data, major contributors and donors will be under your very eyes constantly. PayPal Donations plugin has been built to be as user and customer – friendly as possible. Exemplify and meet your needs through your website visitor’s focus and positive experience when dealing with the easiest PayPal donation system in the form of shortcode or sidebar widget integrated into your website. You can embed your favorite PayPal donation button and let all the donors make their endowments with simple clicks. When adding widget to your sidebar you can also create a title for it, as well as add some specific text above the button. PayPal Donations plugin is already available in a wide range of languages, including Danish, French, German and many others. PayPal Donation Buttons is another PayPal – related plugin solutions for accepting PayPal donations in the simplest fashion. This feature – rich and custom – built WordPress donation plugin has been coded to enable any charitable fund representative or NGO manager to activate PayPal donation button to be available for all the target groups of website viewers, so that the voluntary sector can easily transform to a loyal army of supporters. 9 ordinary PayPal donation buttons are subject to your selection and preference, moreover, you can make use of your own custom button freely. Not only the button, but also Donation Goal with title, shortcode and date fields, as well as Donation list with Transaction ID and its type, Payment status, date, name and amount fields are available with this plugin. PayPal donation is sophisticated and clearly – coded WordPress – compatible charity and donation plugin with the primary concern about charitable trust and humanitarian affairs. Powered to generate super easy platform for the usage, no coding knowledge is necessarily required from the website representative to organize a total surveillance over his donations and intuitively add PayPal donation button to the site for donation purposes and undertakings. This button can be located whenever you may thing reasonable in your web pages, so that it will be visible to your audience and will grab their attention easily. With this powerful plugin you can view all the donations, insert the button into posts and pages with a shortcode, set up specific language, image and currency for each button, select among the available 7 diverse PayPal donation buttons, specify the way PayPal window opens and yet much more to come with the free version of this WordPress donation plugin. Donately Donation Form is a quite simple and lightweight, yet profoundly secure and stable way of adding primary donation functionality to your WordPress self – hosted environment. Use the drag and drop – powered shortcode for your posts and pages or insert widget into the sidebar without any buzz around you. This easy to understand and follow donation strategy will considerably better the donator’s experience and will totally own the donation runway tapping into the power of convenience and usability. This entry was posted in wordpress plugins and tagged charity WordPress donation plugin, ngo donation plugin, trust donation WordPress plugin on April 11, 2019 by SKT Posts Themes. There are a lot of customer reviews and testimonials plugins for WordPress, in the following list. There are many sites that are crawling for user-generated reviews and testimonials nowadays, including Google Places and Google Local Search. WordPress, as we already know is one the largest online website creation tool available today. It is an open source platform and easily accessible by anyone so most of the users like to work on it. People working on WordPress will definitely need customer reviews and testimonials plugins for WordPress. We’ll be focusing on plugins that are popular and highly-rated. Some of them are currently being updated and supported by the developer, and others have some unique feature(s) to set them apart from the rest. It is one of the most common customer reviews and testimonials plugins for WordPress. It allows you to setup a specific page on your blog to receive customer testimonials for your business/service or to write reviews about a product. It has various new features will help you to keep track of customer reviews and testimonials on the site. It is another free plugin that helps you both collect and showcase reviews from your customers. It also adds schema markup for rich snippets and allows you to moderate any customer reviews before you display them on your website. It is one of the simplest customer reviews and testimonials plugins for WordPress. The aesthetics aren’t quite on par with WP Customer Reviews, but other than that it has a similar feature set. It creates shortcodes so you can include review forms, collect reviews, and display them on appropriate posts and pages within your WordPress site. One interesting feature this plugin has is that it uses the Google reviews microformat so these rich snippets would be included in the search, in theory, a boon to local search engine marketing efforts. It is also one of the great and simple customer reviews and testimonials plugins for WordPress available on the internet. It is an easy-to-use, basic plugin that still packs a lot of features. It’s also one of the most popular customer reviews and testimonials plugins for WordPress, with over 80,000 downloads and a rating of 4.6 stars. With Easy Testimonials, you can display your testimonials as a customized widget, or add them to any post or page with a variety of shortcodes. You can also use the Settings menu to generate your own shortcodes with custom display options. One of the best features of this plugin is the ability to control how the testimonials display. There are over 30 different display styles you can choose from, so you can customize the look without having to learn CSS. There’s also a field in the settings menu to enter custom CSS if you want to fine-tune the display further. If you’re running a local business, you might already have a stash of reviews that you can add to your website. Basically, Google Places Reviews helps you add reviews from Google Places to your own website via a handy widget. It is one of the most popular customer reviews and testimonials plugins for WordPress, and when you look at all the included features, it’s easy to see why. With this plugin, you’re not just limited to testimonials; you can also use it to display portfolio projects and reviews. Each testimonial can include videos as well as images and text and supports categories and tags, and review scheme for rich snippets. Once created, the plugin lets you display each of these via shortcodes, widgets, or functions in your theme files. The testimonials display with basic styling and minimal options to change the look, so if you want more display options, you’ll have to know at least a little CSS to really customize how things get displayed. Testimonial Basics is one of the simplest and easy-to-use customer reviews and testimonials plugins for WordPress that make it very easy to add testimonials without complicated options and configurations. There are styling options, including nine different fonts, so you can customize the look easily. The testimonials support both a five-star rating system and Gravatars so you don’t have to upload any images (providing, of course, that the author of the testimonial has a Gravatar associated with their email address). There are input forms included, either as shortcodes or widgets, so you can collect testimonials from customers/clients directly on your website. You can also display your testimonials with shortcodes or widgets. Furthermore, this particular plugin is also available in French, Dutch, German, and Spanish. It is proved to be of great help among all customer reviews and testimonials plugins for WordPress. Research has shown us that displaying testimonials from past customers on your site can create more trust in prospective clients. If you apply the tips for effective testimonials, you will be making their decision process even easier. From the list we provided, you should be able to find the perfect testimonials plug-in for your WordPress website. Start talking to your past clients and getting those quotes to add to your website now. As we said, there are a large number customer reviews and testimonials plugins available for WordPress. We couldn’t possibly cover all of them, but we did our utmost to list all of the best above. Thank you. This entry was posted in wordpress plugins on April 11, 2019 by SKT Themes. They will also be effective in increasing your Twitter followers and getting more and more retweets. Twitter is a powerful social media platform as for present with tons of advantages for outreach and expansion of diverse individual and business affairs across the digital environment. So, the ever – growing groundswell of this outlet will expose every individual and his undertaking to a range of new possibilities and conversion growth accordingly. In this article some of the best and action – provoking samples of Twitter plugins for WordPress are reviewed and presented to consider for your website and to establish a firm connection between your WordPress – powered site and your Twitter account. With each of them your Twitter – related content will be highlighted precisely and presentably through a premium – quality website – level display precedences. To say the least, those products are truly customizable and flexible enough to smoothly subject to all your preferences and business visions in relation to your followers and audience altogether. Twitter widget is a full – packed and dynamic Twitter integration solution for a WordPress – type website of any denomination. Customization controls of this plugin are endless, so that every webmaster can effectively take the leading role over its look and feel and customize it upon his requests. In other words, there is a lot of customization over what is displayed in your website and how it functions for increased results. Twitter widget will let you add the essential buttons, among them Tweet button for post and page sharing, Follow button for enabling your website visitors to follow your Twitter updates from the site, Hashtag button for sharing your posts in Twitter with hashtag, as well as Mention button for mentioning specific Twitter account holder when sharing something. Twitter Feed is another vital and substantial Twitter plugin for WordPress community websites to be acquired and activated for fully – controlled Twitter embedding mechanism for your online existence. It’s a great way of adding your tweets in a few simple clicks by means of widgets and shortcodes. Twitter Feed comes bundled with a bulk of essential features and guarantees an intelligent caching system for optimized performance and comes with readily responsive layout for all kinds of mobiles and devices. Language support is also the integral part of this plugin that enables the usage of both LTR and RTL language variants. Tweet actions, such as likes, replies and retweets and fully enabled as well. Twitter Cards Meta is one of the most energetic and challenging Twitter Card Plugin to integrate short message communication tool with its attributes with your WordPress – powered website. This wonderfully pliable and neatly – structured plugin is brought forward for thousands of WordPress users entirely for free, letting them treat the whole process of the plugin activation and configuration processes as a joy and meeting their further expectations of driving engagement from this system. And what is more exciting about this plugin is that it responsibly generates automatic setup for your posts, and you won’t experience any concern about the image selection for every post, its description and much more. Summary Card, Summary Card with large image, App Card and Player Card are seamlessly supported by this plugin. The next in our list of the top – rated Twitter plugins for WordPress is Twitter Widget Pro. It’s another valuable solution for your WordPress – based site to grab the maximum benefit from Twitter and its feeds. This one also comes bundled with automatic installation process that will take the minimum time and will keep you several kilometers away from complex causes. As for the setup, you only need to follow simplified Twitter account setup and verification guidance, and finally, add Twitter Widget Pro to a widget – friendly space of your site. Subsequently, you will be granted with flawless potential to deal with usernames, hashtags and URLs, showcase profile features and display or hide the tweets time and date. In case you are fond of Twitter area and foresee mind – blowing results from the collaboration of Twitter and your website, then Twitter Button by BestWebSoft is another simple, yet sophisticated way at your command of making an extensive use of Twitter on your WordPress – friendly website by simply adding Tweet, Follow, Hashtag and Mention buttons. With this plugin, you will be the determinant of the button position across your web content, namely before or after, before and after and only shortcode, as well as of setting its options for the website user’s convenience. You may even conclude a list of post types and pages to leave without Twitter buttons. Twitter Auto Publish is one more clearly – coded and compelling Twitter plugin for WordPress that works for any type of WordPress – based product seamlessly. By the application of this original and highly versatile plugin, you will be able to publish simple text or other message with image automatically from your website or blog to your relevant Twitter account, sort out the items that are going to be published, according to their categorization or custom post types, let WordPress page publishing enabled or disable it. There is also a list of post – related attributes that you might publish together with the post, such as post title, description, post excerpt, permalink, user nickname, etc. Twitter is recognized and checked as the official Twitter, Vine and Periscope plugin available for any WordPress website or blog. This generalized mechanism is ensured to provide you with tons of practical controls in order to add single or multiple tweets to your site, as well as follow button, so that all the interested website visitors will be able to stay in close connection with you and be informed about all your updates immediately. This clever and smartly – coded plugin has been projected to be totally user and customer – driven so that it can be freely utilized as one of the productive channels to market your business efficiently. This entry was posted in wordpress plugins on April 10, 2019 by SKT Posts Themes. Nearly 27% of the websites on the internet are fueled by WordPress and there is a good reason for it; this platform makes it easy for startups and small businesses to scale their operations quickly. Open source development has been WordPress’s bread and butter, which has allowed businesses to make the best use of their resources without having to pay huge upfront costs. The multiple tools, plugins and add-ons associated with WordPress are part of its allure because they allow businesses to create a custom website. Businesses, especially those offering coupon codes for various other businesses, such as Couponbuffer and even so many more, can benefit from these plugins. When used correctly, these plugins will allow such websites to provide a top-notch user experience and take their business to the next level. The most popular software for conversion rate optimization is OptinMonster. Every website has some abandoning customers and with this tool, you can convert them into email subscribers. Businesses that wish to grow their email list should definitely make use of this tool because it can later be used for email marketing as well. Every business owner’s top priority should be to allow their customers to get in touch with them. This is where this particular tool can help. It is a contact form plugin for WordPress and is very beginner-friendly. With this drag and drop online form builder, you can easily create email subscription forms, contact forms, payment forms, order forms and other type of online forms with only a few clicks. This is the best plugin for Google Analytics available for WordPress. You can use this plugin for connecting your website to Google Analytics, which enables you to glean more information about your website visitors such as what they are doing on your website and where are they coming from. With this information, you can optimize your website and boost your earnings accordingly. There is a free version of this tool available, but you can get the Pro version for more advanced features. This is one of the best plugins for improving your email marketing efforts. With Constant Contact, you can create email lists and also send emails to your subscribers. It has an easy and quick setup, which makes it quite beginner friendly. Moreover, it also boasts some built-in tools that can be used for adding sign up forms and the tool also works well with other plugins such as OptinMonster. Obviously, you want to have a strong backup system in place for your website. Businesses simply cannot afford to lose their customer data is case their host’s servers are attacked or there is a hardware failure. Therefore, you have to have a backup plugin on your WordPress business site. BackupBuddy is an excellent option as it is easy to use and also very reliable. With only a few clicks, you will be able to back up the data on your website. Every online business is worried about security because there are plenty of risks involved. One of the best protection that you can get for your website is with Sucuri’s web application firewall. With this tool, you can rest assured that your website is monitored and protected against malware threats, brute force attacks, DDoS, XSS attack and any other type of attack. Formerly called WordPress SEO by Yoast, it is one of the most popular plugins for WordPress that you will find. As the name indicates, this tool is designed to help you optimize your website for search engines. Not only can you use Yoast SEO for adding Meta tags, but it can help in optimizing the entire website as a whole. It takes long for images, videos and other static content on the website to load. Every business wants its website to load as fast as possible because customers will not stick around if they don’t. Therefore, you need a CDN for delivering your static files. The most reliable one that you can find for your business site on WordPress is MaxCDN. With this tool, you can easily create and build online communities on your business site. It is regarded as the best WordPress membership plugin, which can be used for adding membership options to your website on WordPress. Subscriptions can be created with this tool and content can be restricted for users based on their subscription status. It is also compatible with the different payment ways, which makes it even more useful. If you are interested in creating and selling online courses via your WordPress website, you will not find any better plugin than LearnDash. This tool boasts a drag and drop course builder that enables you to add quizzes, lessons and assignments quickly for building your course. A large number of business owners wish to sell through their website and this is where WooCommerce can help because this plugin provides you with a professional and complete package. Using it is very easy and it provides a very smooth buying experience to customers. Lots of business owners realize that they can boost their sales and conversions if they place things differently on their website. With Beaver Builder, you can create your own page layouts with ease through a simple user interface. With this drag and drop page builder tool, you don’t need to learn how to code in order to change your website’s layout. This entry was posted in wordpress plugins on April 9, 2019 by SKT Posts Themes. Installing AMP in WordPress is absolutely necessary for today’s scenario to give your mobile users better user experience. AMP or Accelerated Mobile Pages is a cache mechanism offered by Google so that your website and web pages have faster loading speed. In today’s world, the number of mobile users is increasing exponentially as the sales figure of smartphones are increasing in leaps and bounds. But mobile users do not have superfast internet speed and if your web page takes too much time to load, the user will close your website without checking it out. Before installing AMP in WordPress, it is important to understand what AMP is in reality. It is an open source technology offered by Google that will make your content rich web pages load faster. It is achieved by hosting your web pages temporarily on Google AMP cache with limited HTML, JS and CSS code. When a user accesses your web pages, Google can serve those saved cache version instantly to the user. Apart from Google, Facebook, Twitter, Reddit, LinkedIn also use this technology to bring the posts faster to the mobile users. The advantage of Google AMP is that it is not restricted to mobile browsers only. When a mobile user opens your web pages from any third party app or web viewers, Google AMP serves your pages from its cache too. Furthermore, installing AMP in WordPress will help your site rank high on search engine result pages. On the other hand, as the web pages are saved with a limited set of HTML, JS and CSS code, your web page will not appear fully. Any widget or third party integration like email forms, social media boxes, etc. will be suspended. But you can still have Google Analytics. Therefore, the verdict is that if you have a great chunk of your traffic as mobile users, you should definitely install it and give your website a boost and get a lot of mobile users organically. First, you need to install AMP plugin. Go to Admin Dashboard and on the left menu, go to Plugins. Click on Add New from the drop down. In the next screen, search the plugin, install and activate it. Once done, go to Dashboard and from Appearance, go to AMP. You can see how your website looks on mobile devices when you use AMP. Depending on your theme, it might show your logo and favicon. You can do a lot of customization to change the look if you do not like the way it is shown. You can quickly change the font color or header background color. Click on Save button once all the changes are made. In case the page does not open and shows a 404 error, you need to go to Dashboard, Settings and then to Permalinks. Once the next screen opens, do not make any change and just click on Save Changes button. This will update the Permalink and come back to the browser tab and refresh the 404 web page and the web page will appear. Some of you might just be installing AMP in WordPress to get a good rank on Google search engine result pages. You can check out how your website looks on Google search using Google Search Console(GSC). Assuming that you have already added your website to GSC, go to your GSC account and on the left menu, click on Search Appearance. Under it, you will find Accelerated Mobile Pages. Inside it, you will see your website and web pages. It is important to note that your website may not appear immediately after installing the AMP plugin because Google might take a few hours to days to index your web pages. Google AMP comes with limited customization options. There is another popular plugin available named Glue For Yoast SEO & AMP. Before installing it, make sure you have already installed Yoast SEO plugin as it is an add-on to that. To install both the plugins, go to Plugins from Dashboard and click on Add New. Search the plugins, install and activate them. After activation, come back to Dashboard and go to Yoast SEO from the left menu and then from the drop down, click on AMP. In the new screen, you will find advanced options for your AMPs. You can activate AMP cache mechanism for your pages and media as well instead of only posts. If you go to the Design tab, you will find options to set a separate icon for mobile pages, default image for posts with no images, change the color of AMP header, title color, text color and meta info color. This will be handy for branding purpose and making your mobile pages better to look at. There is another tab named Analytics where you can add your Google Analytics ID to gather all the analytics when people access your accelerated mobile pages. If you have a WooCommerce based WordPress website, you should install WP AMP which is a paid plugin. It also supports AdSense and shortcodes. You can also embed items like videos using iFrame. Once you are done with setting up AMP for your website, you need to have a close watch on your Analytics because of late, there are a few complaints that Google AMP is not boosting the traffic as it used to and also the search engine rankings are going down. If you see such a trend, you can disable the plugin else continue with it to provide an awesome user experience. The era of web content has shifted from computers and laptops to mobile devices and tablets. More than 50 per cent of the internet users is using mobile devices. So, something was needed to be done to improve the experience of surfing internet in mobile devices. This is when ‘Accelerated Mobile Pages’ was launched in 2016. Accelerated Mobile pages also known as AMP is a global initiative on website publishing technology that is focused on enhancing the performance of web content on mobile devices. At this moment, all the AMP users are online websites that publish news. However, it is said that AMP will soon become useful for other business purposes too. Big tech companies like Google are already taken the initiative to develop this AMP feature and make it available for websites and companies. While custom designed websites have to develop web pages in AMP HTML coding language rather than traditional HTML and CSS to use the features of AMP. On the other hand, websites developed with WordPress have to just install the AMP plugin to enable AMP for the pages. This where WordPress turns the game quickly. One of the main benefits of the website developed with WordPress AMP is that the pages load 85 per cent faster than traditional web pages developed with just HTML and CSS on mobile devices. Studies show that mobile users leave a webpage if it takes more than 3-4 seconds to load. So, businesses that use AMP technology to develop their website pages can decrease the bounce rate of visitors. AMP also helps to make a website more mobile friendly. AMP also takes part in search engine optimization as page load speed time and mobile friendliness acts as factors to decide the rankings in search engines. This is where a website developed with WordPress AMP can get higher rankings than slower and unresponsive websites. In addition to that, Google search results have started to display AMP content with visually dominating large images and is marked with a clearly visible AMP symbol in green. This visually appealing image tends to attract visitors more than simple displayed content. Moreover, with the increased popularity of AMP, users tend to open pages marked with that green AMP symbol as they seek paster loading times. AMP aims to support a diverse range of advertisement networks and formats. The main objective of AMP technology is to deliver ads that are fast enough allowing good-looking content to grab the viewer’s attention. One more interesting and powerful feature of WordPress AMP technology is that one can able to track visitors data such as new vs returning visitor, clicks vs conversions, video and link tracking by just adding AMP tags. This will greatly act as a marketing tool that will help the business to make decisions by just studying the people’s behaviour analytics on the web pages. This entry was posted in wordpress plugins on April 4, 2019 by SKT Posts Themes. Are you looking for the affordable ways to fix WordPress 404 errors when the post, page or custom post type does exist? Yes, it’s really irritating to encounter any WordPress error and feel unable to fix it. But don’t worry; you are not the only one with such thoughts and concerns. WordPress 404 not found errors are among the most commonly occurring errors and don’t need a heavy work around to fix them. There are just a few steps to follow which may take you some time but will help to get rid of those frustrating errors. Although WordPress CMS is pretty secure and error free in its performance, sometimes slight errors or tweaks can make your WordPress site or blog quite inaccessible for your visitors. WordPress 404 not found errors are among such tweaks which need immediate intervention in order to disappear and let your website go back into gear. With this in mind, in this article we are going to show you how to fix WordPress 404 errors easily and quickly. What is WordPress 404 or 404 not found error? It is a Hypertext Transfer Protocol (HTTP) standard response code stating that the requested page has not been found by the client. All in all, it is one of the major factors that can negatively affect your site’s SEO and increase its bounce rate. Therefore the sooner you fix such kind of errors, the better for your website and its results. How to fix WordPress 404 errors? Well, the basic cause of such problem has to do with Apache extension mod_rewrite, which is not capable of rewriting your site’s URLs to use already chosen pretty permalinks. Permalinks are the permanent URLs to your site’s posts, categories, and other lists of postings. As for the pretty permalinks, these are more than just the default option and can include more other options like the date when the post was written, post title and more. As soon as you install the WordPress, it automatically enables pretty permalinks. However, you are the one to decide what to display in them. So, whenever, the Apache extension mod_rewrite is disabled or there are some discrepancies with plugin and template, those links stop working. In order to fix the problem with Apache extension, you need to fix your permalink settings. The first thing you can do is to just update the settings without changing anything. Head over your Admin Dashboard, Settings, Permalink and just click on Save Changes. This trick might do the job if you have not done custom modifications to the .htaccess file previously. If not, you’ll need to manually tweak to your .htaccess file and update it. For this, you need to use your FTP Client or cPanel in order to access .htaccess file located in the root of your website where folders like /wp-content/ and /wp-includes/ are also deployed. Before editing any file trying to fix WordPress 404 errors, you need to take a full backup of your site so that you will not feel pangs of remorse in the future if anything goes wrong. This code is valid for single installations of WordPress. Once you are done with adding the relevant code, save the file back to the server. WordPress 404 errors should already be solved. If the above discussed solutions are not enough, the next step is to make sure whether your .htaccess file permissions are properly set up. (we have how to fix file permissions error in WP with useful information about file permissions). Whenever you doing your best to fix WordPress 404 errors, some parts of your site still remain inaccessible for your audience and disliked by search engines. Therefore, it is reasonable to use some of the useful plugins available for now and redirect 404 pages to homepage so that you can improve your site’s rankings. This plugin is exactly what we need. Whenever you are faced with 404 page not found error, it will help you redirect such pages to your site’s homepage. Redirect 404 Error Page to Homepage or Custom is the next handy tool to be of much assistance to you whenever you are fighting for keeping your site’s online reputation and SEO rankings. Redirect those error pages to homepage, about us or any custom page to keep your audience on your profile while you are trying to get rid of that error. Redirection by John Godley is a fantastic SEO 301 redirection tool to save the precious SEO rankings and results of your site. All in all, this fully localized and top rated plugin is feature rich and frequently updated with new elements. It is essentially very important to keep the user experience high to create a good reputation in the competitive market and to create an everlasting impression upon your consumers. The reputation can get distorted if someday users run into ‘404 errors’ in your business website. You definitely don’t want to forever lose your customers for this type of stupid reasons, right? ‘404’ is a response code that shows up on the web browser when it cannot find the page or the content the user is looking for. The browser will always search for the URL entered in the browser regardless of its existence and if can’t find the URL, the WordPress ‘404’ error shows up. The error is pretty straightforward and the main cause of this is due to any mistyped internal links in the website or missing contents. So, it’s best practice to take care of the page URLs and also to remove the links from the website that are no longer accessible or does not exist anymore. This sounds a lot of hectic work but it needs to be done because there are certain negative impacts of these WordPress 404 errors. Many people will leave your website immediately if these type of errors pop up on the web browser and hence will increase the bounce rate and ultimately can severely affect your search engine optimization (SEO). Even if these 404 errors are not your fault these can ruin the image of your website as well as of the business because no one likes to explore a broken website. Sometimes it may also happen that your visitors will get frustrated due to this type of error as they could not differentiate between a website being down and 404 error. So, when this type of errors appears, quick fixing them on your website, is imperative. A link that does not exist is called a broken link. You may check broken links manually but that would be a hectic job to accomplish. Rather if you are using WordPress for developing your website, then your work would become much easy as it provides multiple methods to tackle these WordPress 404 errors. You may install a plugin known as the broken link checker plugin. This plugin allows you to enhance the speed of the process by automatically checking the internal and external links on the website to report any broken or missing links. You have to install and activate the plugin on your website. After activating the plugin, it will run it first check automatically and will display the results of any broken links on the user’s dashboard. If this checker plugin able to finds one link that is broken, it will notify its location on your website so that you can jump in and fix the link. One of another way to fix this type of error is to update your .htaccess file via the WordPress dashboard but that will require you to change the access permissions in the backend. So, the above-mentioned plugin method is considered to be the easiest and most used method to save your website from these WordPress 404 errors. If unfortunately, your website runs into these WordPress 404 errors, you need to properly display the error so that the visitors don’t run away after seeing the word ‘error’ on your site. So, it would be a good practice to create a custom error page showing the details of the nature of 404 error. There are a bunch of layouts and templates available in WordPress to help you create one. Remember, this is not a solution to fix up 404 errors but it’s a method to inform your customers adequately about the errors your website is running into and lessen the negative impacts on your business. This entry was posted in wordpress plugins on April 3, 2019 by SKT Posts Themes.